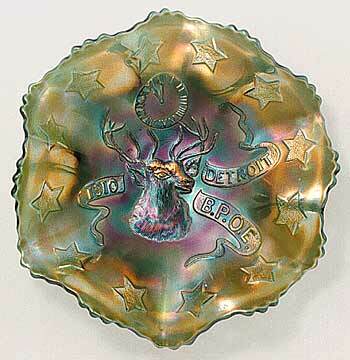 Fenton made 7-inch bowls, plates, and bells for several B.P.O.E. conventions. In the Fenton version, the elk always looks to the viewer's right. Most bowls are ruffled but three-in-one and round bowls are also found. A real rarity is a bell made for the 1912 Portland convention--only one is known. 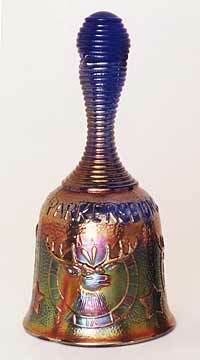 Shown are a green 1910 Detroit ruffled bowl and a blue 1914 Parkersburg bell. Millersburg also made bowls for the 1910 convention. "The 1910 National Grand Reunion of the B.P.O.E. was held at the Poncharpariam Hotel, (had them spell that one for me three times, and am still not sure I got it right) Detroit, Michigan, from July 11-15. The Liccium Theater of the aforementioned hotel was the site of their banquet. Sourvenir-wise, the Detroit Reunion was the grand daddy of them all. Five different pieces were struck for this event, and if you count separate colors, the number swells to nine. You will find eight of these pieces delineated in the text; the ninth is the Elks Nappy which has no lettering on it." 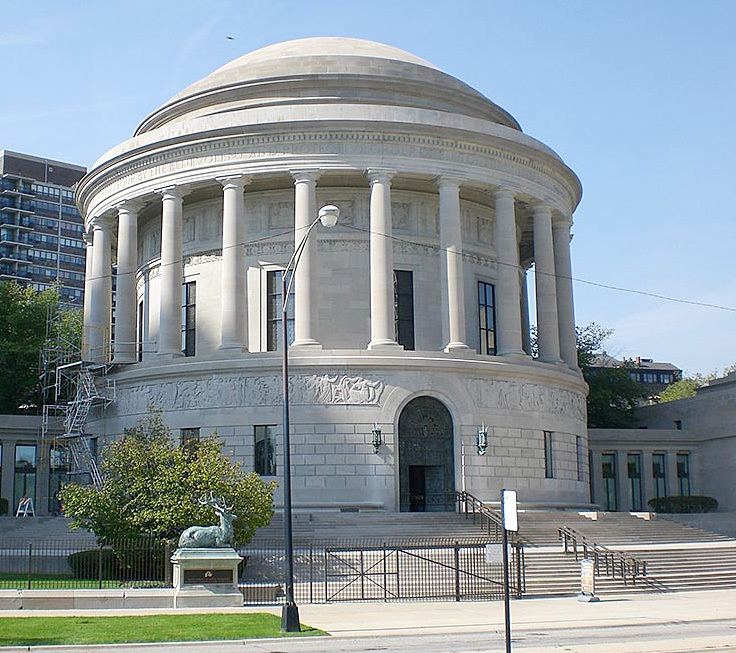 Construction of the Elks National Memorial began in 1923, after the Order unanimously agreed on a spacious site for the building, looking out over Chicago's Lincoln Park and within a stone's throw of Lake Michigan. This photo was taken in 2013. Note the sculpture of an elk resting on a pedestal in front.